Like the other two bottlings in our recent look at Glenmorangie’s 12 year old finished whisky, Glenmorangie Quinta Ruban is the original 10 year old single malt, aged in first and second fill bourbon casks, and this time around is finished for a further two years in port wine “pipes.” A Port pipe is a longer, tapered cask that holds 600L of port wine. Port is exclusively produced in the region of Douro in northern Portugal, and like it’s Spanish counterpart, sherry, is considered a sweet dessert wine. Technically, port wine is a fortified wine, meaning that at an early point in fermentation, a high ABV neutral grape brandy is added to the mix which halts the fermentation process, thus allowing the residual sugars to escape the conversion to alcohol. The consummated product is both very sweet and high in alcohol content (15 to 20% ABV). Quinta Ruban is a 12 year old, non chill filtered single malt bottled at 46% ABV. Whereas LaSanta is the token sherry selection, and Nectar D’or the elegant indulgence, Quinta Ruban is the full bodied flavor punch, as the port finish has increased the sweetness and texture of the final product. It is clearly the best tasting of the bunch. On to it…. Nose- Bold, active. Dried, dark fruits. Cherries and chocolate. Herbal with a touch of mint and rose petals, tea-like. Rich and sweet. Taste- Rich and viscous. Taste nicely reflects the nose. Some coffee and dark chocolate. Finish- Short to medium length. Some smoke and cereal notes. Sweetness eludes the finish, drying. Comments- Our favorite of the three mainstream finished Glenmorangies. Rich, lovely and a definite repeat purchase. Hey, I manage the spirits at B’s Garland Market and I recently got in two bottles of the Four Roses Small Batch Limited Edition. I’ve already sold one to a friend and I thought I’d offer up the second to someone who might really appreciate it. We’re asking $114.99 before tax and it’s your’s if you want it. Please give me a call (509 953-9809) and let me know if you’re interested. Only 11 bottles made it over to this side of the state and I’ll have no problem selling it if you want to take a pass, but give me a call either way if you don’t mind. Truth is, I’ve been wanting to talk to someone from The Spokane Whiskey club on anther matter anyway, so if you’d give me a call back, I’d appreciate it. Quintana Ruban is my favorite. 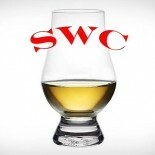 A great single malt scotch.